Although he has always been passionate about art, he shied away from it in high school. Other activities like marching band, track and other team sports consumed his time. Additionally, he wanted to avoid the stigma that sometimes comes with being an artist, one he described as a lone-wolf type on the fringes who struggles to make a decent living. During college, Schrock-Shenk says, “I wanted to live through my passion for art.” He picked up drawing again upon arriving at GC because he wasn’t sure what else he wanted to do, and it seemed like a good place to start. Classes like Sculpture, Watercolor, Jewelry Making and Figure Drawing have been several of his favorites. He sees figure drawing as a fundamental course, especially considering that the great Renaissance artists honed that skill before working in other areas like sculpture and painting. Schrock-Shenk initially declared an art education major because he believes in the importance of giving back to future generations. After student teaching, however, he found that going to the same building day after day and being somewhat “institutionalized” is not what he had envisioned for himself. Now, he is majoring in graphic design with hopes of doing independent projects while also sharing ideas with and working alongside other artists. One drawback of graphic design for Schrock-Shenk is that the level of interaction with the work is different on a computer than it is with physical materials. “I lose the ability to touch what I’m making,” he said. For his senior art show, he plans to use some sculpture pieces he has worked on over the years. He approaches artwork conceptually, focusing on conveying a certain idea through the final piece. The focus of his most recent sculptures is movement, the way we move through life. Schrock-Shenk experiences art as an outlet to work through things going on in his life. When he struggles to find inspiration, he recalls his childhood and the year he came to live in the United States. Originally from the Phillipines, Schrock-Shenk was adopted and came to live in Lancaster, PA for a short time before settling in Goshen, IN with his family. He sees his adoption as a “second chance on life.” In future work, Schrock-Shenk wants to live out the mission statement of MCC, the organization that in part made it possible for him to live here. Looking forward, he wants to continue fighting the stigma that artists are involved with their own lives by embodying his desire to give back. He finds inspiration in his experiences, including travel. 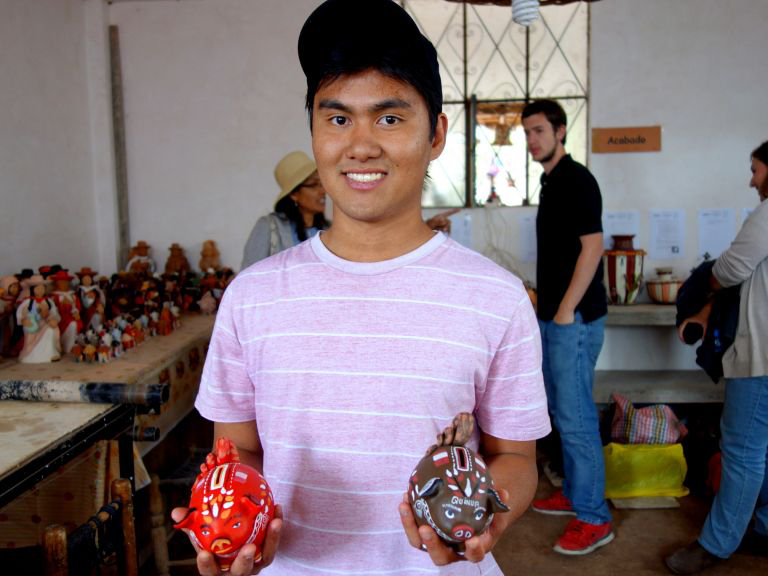 Last year, Schrock-Shenk spent the fall semester in Peru, where he worked with a family of artisans for six weeks in a town called Quinua. A typical six to eight-hour day in his family’s art studio consisted of painting clay figures, sorting and firing pieces in different kilns, hiking for hours to hunt down a certain pigment and sharing his love of art with other international students living nearby. He says that a shared understanding of art allowed him to connect with his host dad and brother spiritually, and that, “the studio was a sacred space.” Since he didn’t grow up in the culture he was born into, his time in Peru helped him reflect and explore the ways art communicates culture and translates across cultures. Following graduation, Schrock-Shenk plans to freelance and maybe work for a company in-house so that he can interact with other graphic designers and share ideas. Whatever he does, he wants it to be meaningful.